(Photo courtesy of the Utah Governor's Office) Aerial views of the Brian Head fire in Utah last summer. The Dixie National Forest is proposing to log some of the woods burned in the Brian Head fire, which scorched about 72,000 acres last summer in the highlands between Parowan and Panguitch. 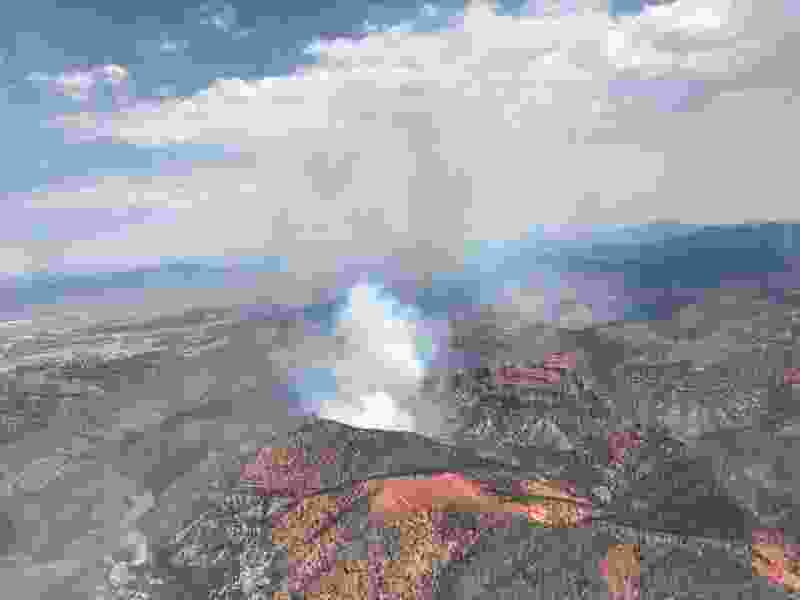 The Dixie National Forest hopes to quickly log some of the woods burned in the Brian Head Fire, which scorched about 72,000 acres last summer in the highlands between Parowan and Panguitch. Reseeding of the blackened acreage is set to commence later this month. Under a logging proposal unveiled in late October, officials would target patches totaling just 250 acres along State Route 143 and a Forest Service route known as the Clear Creek Road connecting Panguitch Lake and Yankee Meadows where Garfield and Iron counties meet. The goal is to cut “merchantable” ponderosa pine before the dead trees lose value as they degrade from insect and weather damage, or pose a threat to the traveling public. “The focus is on areas with health and safety concerns,” said Richard Jaros, ecosystems staff officer with the Dixie forest. Spruce, much of it previously killed in a bark beetle epidemic, and fir would also be cut, but these trees have little value beyond fire wood. “The ponderosa was green when it burned so it still has marketability,” Jaros said. 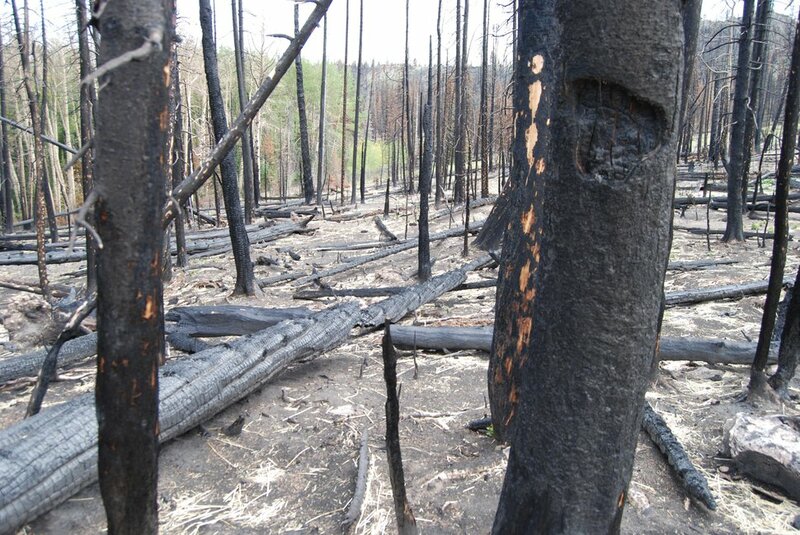 The Forest Service has launched an environmental analysis on the proposal and expects to initiate an analysis of a broader salvage-logging project later this month involving thousands of acres. Officials are accepting public “scoping” comments, used to determine the level of environmental review, through Friday. Comments can be emailed to Jaros at sjaros@fs.fed.us. Meanwhile, the Forest Service with its state partners will begin applying seeds aerially this month on nearly 17,000 acres in the hope of speeding the recovering of grasses and forbs. More than 5,000 acres have already been mulched and treated with sterile triticale seed in an emergency effort to stabilize soils. Reseeding will target the mulched areas and other places that were burned with the greatest severity, according to Curtis Roundy, a project manager with Utah’s Watershed Restoration Initiative. The Division of Wildlife Resources’ Great Basin Research Center in Ephraim will supply 182,000 of seed for the project. Areas to be treated include the basins surrounding Little Creek and Yankee Meadows reservoirs, Clear and Bunker creeks and Horse Valley. Elevation and the presence of critical mule deer and sage grouse habitat also played a role in deciding which areas to treat. “We are trying to maximize the benefit of the money we are putting on the landscape,” Roundy said. These burn-area rehabilitation efforts are costing nearly $5.8 million, on top of the $36 million spent on fighting what turned out to be the most expensive fire in Utah history.